Those people who say physics never did them any good after high school probably never used science to argue their way out of an expensive traffic ticket. 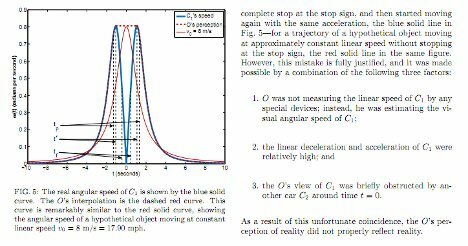 Dmitri Krioukov, a physicist at the University of California, San Diego, was issued a $400 ticket for failing to stop at a stop sign. He wrote up a four-page defense (available online as a PDF) complete with complicated graphs and diagrams to support his claim that the officer only thought he saw Krioukov run the sign. Krioukov pointed out that, from his vantage point 100 feet away from the stop sign, the police officer was blinded by science at a crucial moment. According to the lengthy defense document, an observer can easily mistake an object which decelerates and then accelerates very quickly for an object traveling at a constant speed, provided that the observer’s vision is obscured at precisely the right moment. The alleged stop sign runner pointed out that as he was approaching the stop sign, he sneezed and then had to decelerate very quickly. At the moment he came to a fast – but complete – stop, an SUV drove past Krioukov’s Toyota Yaris and obscured the officer’s view of it for a moment. When Kioukov then accelerated quickly away from the sign, the officer mistakenly believed he had never stopped at all. 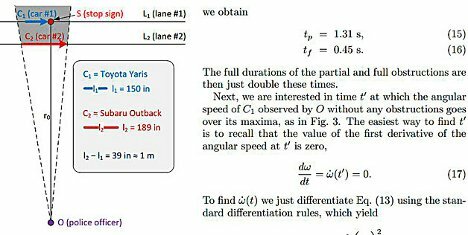 We don’t have advanced degrees in physics, and neither did the people in the courtroom when Krioukov presented his defense – and being unable to refute his claims, the judge dismissed the ticket. See more in Weird Science or under Science. April, 2012.